A new book is out and I am excited to share my thoughts about it with you, as we approach World Down Syndrome Day on March 21. I was given a copy of the book in exchange for my honest review. 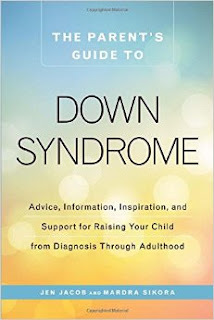 The two authors of this book are parents of children with Down syndrome themselves, and Jen Jacob is the Vice President and co-founder of the Down Syndrome Diagnosis Network. I joined one of her online parent groups a while back, and I contributed our birth story to her book, Unexpected, which you can find HERE. I will start off by saying, this book has just about everything you could need or want to know as a new parent to a child with Down syndrome, but also as a parent of an older child or adult. I am absolutely amazed at how thorough the information is. I will also say that I only skimmed the last parts of the book, as it gets into the older years, and I try to take things one day at a time! Each section deals with a different topic, and the chapters move up in age from pre-natal diagnosis and birth to adulthood. I love the tone of this book. Written by two very knowledgeable and experienced women, and contributed to by probably hundreds of parents, it explains the facts and the possibilities (which vary greatly) in a way that still highlights positives. For example, when speaking of hypotonia, "Some doctors may describe your child as "floppy" or "lacking stability." In any case, you will probably notice your baby is extra snuggly. It may feel as if your infant has melted right into you as you hold her." I love this so much. The books that I have previously read about Down syndrome are all fact, and are lacking that personal touch and that positive outlook! It is definitely true for us that Ari ended up being the easier baby of our two! My other favorite thing about this book, which adds to the above sentiment, is that every topic includes a section called "Our Experience," where actual parents, relatives, or adults with Down syndrome, share their personal stories about a particular topic. This is usually a short story or just a one or two sentence explanation. It adds so so much to the personal feel of the book, and shows how greatly each person's experience can vary. I think it would be helpful for new parents to know what to expect, but to also know that their child is an individual and will have his or her own experiences. I remember reading the book that I was given, and thinking that my child was going to have all of the listed medical problems, when in actuality, he's had very few. I can honestly say that I think this book is the best available for current information on all things Down syndrome, keeping in mind that it is not an encyclopedia, but a starting point. If you want more information about any topic, you can find it online or in the listed resources. This book breaks everything down into bite-size pieces that make it an easy read, and a great introduction. The only thing that I would have liked to see included, that wasn't, was more details about what Down syndrome is from a detailed genetic point of view. But, not everyone needs that, and it can certainly be found online or in other publications. If you are interested in purchasing a copy, click HERE or you can purchase on Amazon or your local Barnes and Noble. This review is part of a virtual book tour, and the authors are doing an awesome giveaway. The grand prize includes an “I love someone with Down syndrome” tote, an advocate coffee mug, a great variety of books including, of course, The Parent’s Guide to Down Syndrome, plus fun t-shirt, stickers, and more! A value of over $150! To enter, click the link below! Those photos are so cute. Children are always so beautiful!